We take commercial bulk orders on high quality lint-free commercial tissue rolls that can be used for a wide range of purposes. From hotels to restaurants, everywhere tissues are needed mandatorily. All offices without exception also need the tissues for maintaining hygiene standards. Ordering in bulk is the most cost affordable practical solution. 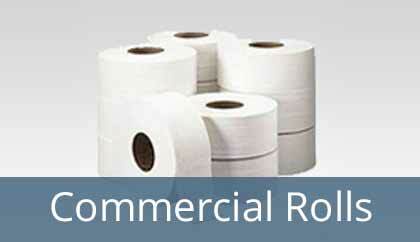 Tissue papers are something that are applied in daily use in huge amounts. They get depleted fast, and getting out of tissues is very inconvenient and unhygienic. Just imagine an office toilet running out of tissue papers for a day! In order to avoid such circumstances, it is important to keep the stocks ready in advance. Any gap in the tissue supply can lead to a serious brand impression issue as well. For example, a restaurant cannot really afford to take the risk of running out of tissues because that will create a negative impression among diners. We can print the tissues in customized formats with your brand logo and preferred color as well. In addition, the thick tissues can also be used to print page layouts or commercial brochures. All bulk rate inquiries are welcome, customized or plain.